Do you like to laugh? Of course you do! 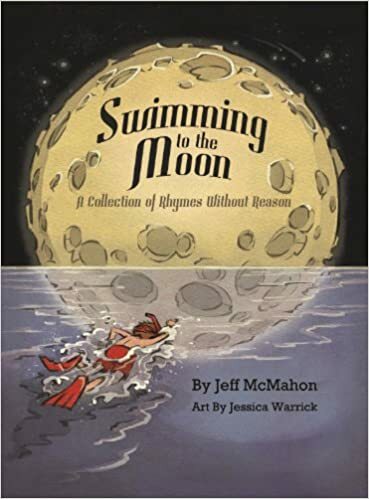 If you like to read silly, imaginative, out-of-this-world goofy poems, then you need to check out Swimming to the Moon - you won't be disappointed. Author Jeff McMahon has compiled a fantastic collection of his wittiest poems for readers to enjoy. From something we've all experienced, "Gum On My Shoe" to the downright bizarre, "I Once Fell Up The Stairs," this selection shows the author's talent at coming up with witty poems that flow well and bring a laugh on just about every page. Some poems in this book are quite short, such as "Lucky Horseshoe,"
It's been very good to me. since I found it, luckily. to Show and Tell of course. still fastened to the horse. while others are much longer and tell a short story, such as the title poem, "Swimming to the Moon," which tells the story of a youngster who wants to swim to the moon because he can't afford a rocket. I get the sense that the author is always doodling, coming up with clever little poems as these gems seem to come from a pen that has seen many hilarious tales come to life. Add in the fantastic black and white drawings by illustrator Jessica Warrick, and you have a definite winner. Although written for the young, anybody who likes to laugh (and again, don't we all?) is sure to enjoy this wonderful selection of "Rhymes Without Reason." Quill says: Guaranteed to make you giggle, gaggle, and get downright goofy, Swimming to the Moon is a great book for kids of all ages!